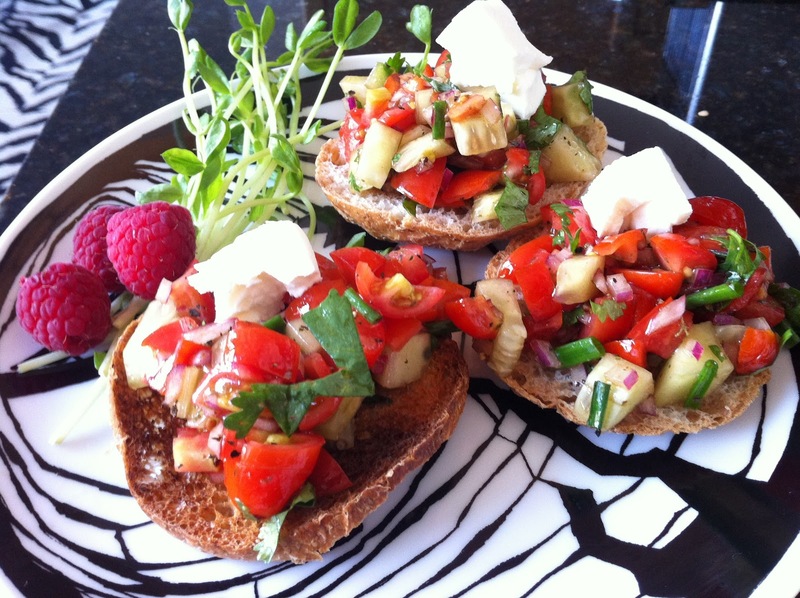 Bruschetta is an easy-to-make and flexible appetizer - it's especially good for a late evening snack since it's not too heavy but full of flavor. Prep the toast. I use any old bread - baguettes, challah, dinner rolls, whatever. It works best when it's just starting to stale, but if not, toast them lightly on both sides under a broiler. It's important to make both sides dried and stiff as a base for the tomatos. Chop tomato (use very ripe ones - in this photo I've actually used grape tomatos) and onions (I prefer red onions for the color or Vidalia for the taste) - about 1/2 cup of each. Toss in 1/4C chopped Italian parsley or cilantro, some (maybe 1 clove of) smashed garlic (or even garlic powder - 1/4 tsp), sea salt and pepper to taste, 1 Tbsp of olive oil and 2 tsp of vinegar (I used balsamic but red wine works equally well). Mix well in a bowl. Spoon the mix on top of the toast. Garnish your plate. I can't express how important garnish is - it may be a waste of food sometimes but it always makes the plate more appetizing. The garnish is so pretty- totally makes it special. I always make bruschetta with just onions and tomatoes! I'm definitely trying this one!!! Looks yum!